On May 6, 2014, the Village Council approved an ordinance that will allow residents to keep hens in their rear yards, with a permit issued by the Village following proof of consent by neighboring property owners. Only hens will be permitted. All other fowl, including roosters, are prohibited. No person shall keep more than four hens. Properties currently eligible under the 50-foot setback requirements will not be required to obtain a permit, unless seeking to place the structure less than 50 feet from all property lines of an adjacent property. 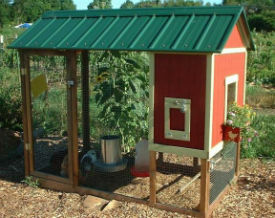 Structures housing hens shall be located in the rear yard only. Under the neighbor consent model, the setback requirement for a structure housing hens is seven feet from all property lines of an adjacent property. Adjacent is defined as a parcel that comes into contact with the applicant's property at one or more points. The permit application shall include a consent form signed by each adjacent property owner and tenant. The fee for the permit is $84 as defined in the Village's User-Fee, License and Fine Schedule. Permits will be limited to single-family detached residences and will expire five years after the date of issuance. All feed shall be kept in rodent-proof containers. Residents seeking a permit to keep hens must use the consent form on the permit application provided by the Village. Permits will be issued beginning May 19, 2014.